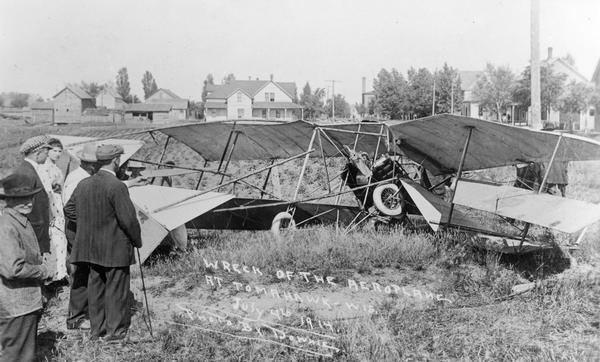 The wreck of John Kaminski's plane, where he had been scheduled to fly at the Fourth of July festivities. Kaminski later recalled this incident as one of his most serious accidents. "At Tomahawk, I had to take off directly from the street in the heart of the city. My first flight in the morning went off without mishap. In the afternoon, however, a stiff wind sprang up and blew sand and dust around. The city fire department was called out to wet the street and lay the dust. As I started my machine, it began to skid on the wet pavement. I had intended to fly above some high tension wires which crossed the street about a block away. Because of the wet pavement which caused my plane to skid, I saw that I would have to get under the wires. Both sides of the street were lined with people watching the exhibition. As I hit the street intersection traveling at about 70 miles per hour, a cross wind caught my plane and swerved it toward the crowd of spectators. In order to avoid plunging into them, I banked my plane and hit a telegraph post with my left aileron and plunged my nose into the ground. I was knocked unconscious but was soon revived with very little damage to myself but quite a bit of damage to my plane." The postcard of this incident was produced by a Tomahawk area photographer. It is evidence of the somewhat ghoulish public fascination with plane crashes. The danger did not deter Kaminski, but he was about the public. "Of course I will get killed, if I fly long enough," he told reporters in 1912. "So will I die if I live long enough... We are living in a fast age and the aviator who is willing to sacrifice his bones and gore on the altar of a highly seasoned and chance-taking sport, is going to be the one to draw the crowds. I am not egotistical to believe that the crowds come to see me perform some great tricks. Not on your life! They smell danger and they want to be there if I drop ... from the sky."